3:10 p.m. - 7:00 p.m. HOMELESS! Where will the Raiders play in 2019? Oakland, San Fran, parts unknown? ALAMEDA, Calif. — While a major league baseball team in San Francisco owns territorial rights to San Jose, an NFL team in Santa Clara owns territorial rights to San Francisco. And with San Francisco Mayor London Breed saying the Raiders “should play in Oakland” in her rebuffing the Silver and Black relocating to the San Francisco Giants’ waterfront Oracle Park for one season, The City has no problem poaching the NBA champion Golden State Warriors from The Town. Oh, and both Oakland’s Raiders and Warriors began their Bay Area stays in San Francisco, with the Raiders playing at Kezar Stadium in 1960 and at Candlestick Park in 1961 and the Warriors in the Cow Palace and the Civic Auditorium from 1962 through 1968. And with those nuggets of knowledge, welcome to the strange goings-on in the Bay Area when it comes to teams moving home bases, in general, and the Raiders looking for a home for 2019, in particular. You have questions, we have thoughts and, hopefully, answers. The Raiders, in the aftermath of their winning approval in April 2017 to move to Las Vegas in 2020, exercised their options to stay in the Oakland Coliseum for the 2017 and 2018 seasons. Raiders owner Mark Davis had long said his first desire was to stay in Oakland in 2019 and the Raiders had a $7.5 million lease offer for one final season at the Oakland Coliseum on the table. This after having their rent tripled in recent years. But after the city of Oakland announced its intentions in December to sue the Raiders and the NFL over the team’s pending move to southern Nevada, the Raiders pulled their offer, with Davis calling the lawsuit “meritless and malicious” and saying “all options are open” for his team in 2019. Depends upon the day and the hour. One week ago, it looked as though the Raiders would go full circle when it came to San Francisco and play at the Giants’ baseball yard, which has hosted football in the past — from the defunct XFL to a college bowl game to Cal for a full season. Yes, even if the Raiders have more season-ticket holders than the baseball stadium has seats, and a lot of massaging would have had to be performed. But before all the t’s could be crossed and all the i’s dotted, word leaked that the 49ers, who play their games 43 miles south of Oracle Park in Santa Clara (the Oakland Coliseum is 16 miles across the San Francisco Bay from Oracle Park), would not yield those territorial rights to the Raiders. Compensation might have been discussed, but would that not have simply strengthened Oakland’s case against the NFL that its teams simply pay off each other in a monopoly? 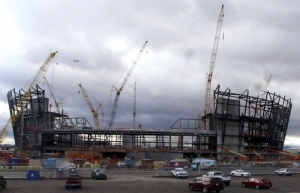 Indeed, the Niners would seemingly be more than happy to then take the Raiders’ rent money at Levi’s Stadium, which opened in 2014 and was built to house two NFL teams. But Davis abhors the idea and, well, the commute, joking a few years back that he could get to Los Angeles quicker on a flight than from Oakland to Santa Clara in a car at rush hour. Reports came out over the weekend that Oakland told the Raiders it was willing to come back to the table to negotiate a one-year lease, though team officials would not comment. So where will the Raiders play home games in 2019? How far behind the eight ball are the Raiders in finding a home? The NFL wanted to know by early February at the latest, for scheduling purposes, where the Parts Unknown Raiders will call home this fall and, well, here we are in the second week of the second month. Yeah, it seems counterproductive, and while it is a different world, consider: the Raiders did not win court approval to move from Oakland to Los Angeles in 1982 until MAY! And they did not announce the move back to Oakland in 1995 until JUNE! So, they’re actually ahead of the curve, from a certain point of view — even if they did practice in Alameda during the week and travel to L.A. for home games in 1982 and then practice in L.A. during the week and travel to Oakland for home games in 1995. Oh, and the Raiders will continue to practice in Alameda in 2019 before going to Henderson in the spring of 2020. Copyright 2016. Internet development by Triton Digital. All rights reserved.